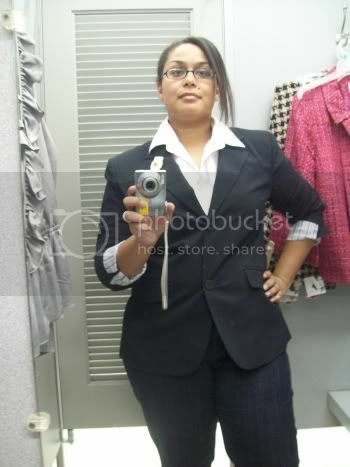 Kmart - Fall Tweed Suit IRL Pictures Below the Cut! I went in and found the suit. I tried real hard, but for some reason, the brightness of the pink would NOT photograph in the mirror. It kept looking like a blurry mess.. I went ahead and tried it on in the other colorway they have so we could see what it looked like shapewise. (Different names online, but exact same fit/suit. The jacket is cut to stay open, as shown. Its cut diagonally away from the collar. The positive to this outfit is that it is relatively cheap...and would be a good way to get this look without putting out alot of cash. The cost is $25 for the jacket and $20 for the skirt - on sale this week. Sadly, my figure was totally lost in the jacket - its a true swing jacket, and no where near as fitted as it looks in the ad. 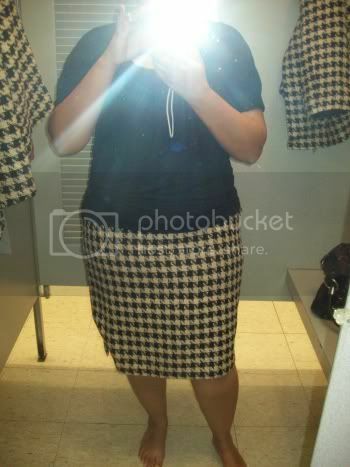 The skirt was not sewed well to the lining, so it was all twisted up on the sides - but not all were like this. I felt very mumsy in the full outfit, but the jacket looks strange alone. Verdict: You must try this on in person. Do not buy online, the sizing is odd, and you have to find the good ones (turn it inside out.) Overall, ok for the price, but be wary. Its not for me, but maybe someone else. 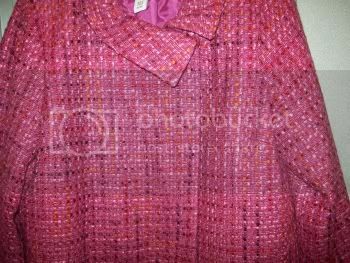 I also found a cute little jacket, and the pic of the tag did not come out, and I cannot find it online. Sorry!! The sleeves are lined in the contrast material. If anyone has any info on it, let me know! Do you mean that the pink is to cheap looking?I'll trust you on that one. I like the skirt that you tried.And the jacket. Thanks for the pictures. When I saw that ad I loved the pink suit. Thanks for the advice. Happy you found something to take home. 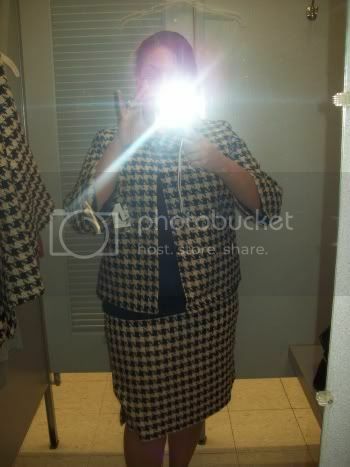 Will that blk jacket go with the houndstooth skirt? I hate it when something you see in a magazine turns out to be, in real life, quite disappointing. I like the black jacket you found. Nurmisur - I am not sure if its cheap looking perse, I think you have to see it person. The tweed is not as delicate as it appears in the ad, so its going to be a personal preferecnce things there. Gigi/Sher/Goober - I actually did not get the jacket. The next thing I tried on was a sweater... I didn't even check the label to see what it was made of, and once I put in on there was rabbit hair everywhere, (who woulda thought at Kmart??) and then I got hives, so I just put everything back and left. 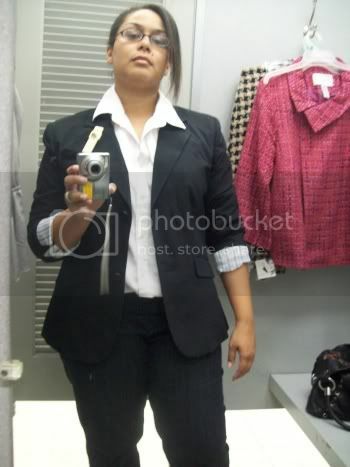 LOL I may go back for the jacket later. ewwwwww. i just starting itching lol. I love the first skirt and sweater. too bad about the hair...that outfit was HAWT. No likey the pink suit at all. oh Patina - it was all in my throat too and stuck my lip gloss.... icky.